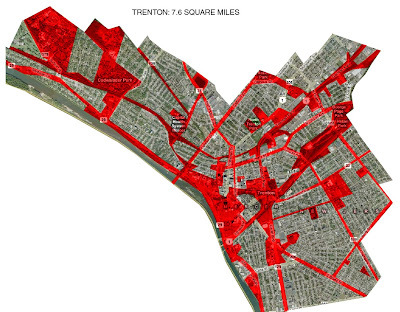 According to the City's proposed budget, 52% of Trenton is not taxable. We as a city are home to non-profits, churches, Federal State County and City facilities, major right of ways, parks, and schools. I attempted a cheesy photoshop job with rough outlines on non-taxable land. Its an interesting (if imperfect) diagram that reveals how the city is sliced up from a ratable standpoint. The areas with the highest inherent value are also the areas with the highest concentration of non-ratables (the waterfront, the most urban downtown core, major transportation corridors). And just to hammer the point home of how much land is not utilized, I’ve attached cheesy photoshop job #2 which shows the amount of land (roughly 3.75 square miles) which is not being taxed. Its the size of lower Manhattan. 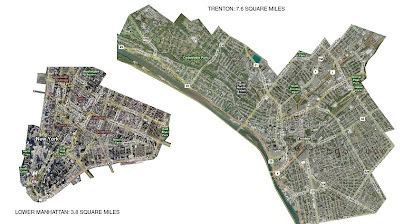 Its at the same scale as Trenton to help give you an idea of the relative big-ness of our city and the impact of all of this un-ratable land mass.